Help pls. Grandma was slow.. banned me. For what? Which reason. Permament ban. Re: GRANDMA banned me. Why? You'll have to ask the player/players who banned you. We don't oversee server bans. Interestingly I was banned from some random server I tried to join y-day, in which I had never been before. Some strange stuff. Server name is: "82nd ADB MAPVOTE!" 206.123.66.210. Not that I care of course, but just some weird stuff. Says "Your MAC is banned on the server, permament". it is a bug, eventually it will go away. 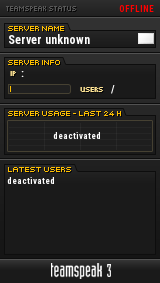 I asked General_alkos (server admin) - he said, he doesn;t see a ban from admin panel. When I played on server, I saw in colsole - "Server is attacked" or something else, next kicked me. Server hacked? Is it possible?